The new Mercedes-Benz E 300 Sport has been fully redesigned and is one of the most technologically advanced cars available today. Drivers appreciate the E 300 Sport’s turbocharged 2.0L 4-cylinder engine that offers 241 hp and 273 lb-ft of torque. Whether you’re cruising around Alpharetta or commuting to and from work in Johns Creek, GA, you’ll have the latest technology at your fingertips with the COMAND® infotainment system that comes standard on all E-Class models. The new Mercedes-Benz E 300 Sport drives smoothy, thanks to a well-designed suspension, strong breaks and easy steering. 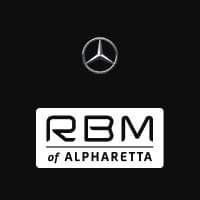 Why Buy a New Mercedes-Benz E 300 Sport from RBM of Alpharetta? For a dealership that truly understands the importance of the car-buying experience, head to RBM of Alpharetta. We know what drivers in Fulton County are looking for. Not only that, but our finance department works with you to find a new Mercedes-Benz that fits your budget. Visit our showroom, so you can you can test drive the new Mercedes-Benz E 300 Sport and see for yourself how well it handles. Contact us today to set up a showing and start your journey to becoming a proud Mercedes-Benz owner!